I love gummy bears (Black Forest is the best, I say - pineapple bears being the piece de resistance). My husband rolls his eyes and thinks I have terrible taste in candy. Well, he can think what he will! Gummies are good, gummies are great! With home equipment and ingredients, you just don't have much of a prayer of duplicating commercial gummies. I did happen upon a recipe recently, on WikiHow, that comes closer than any other I've tried. Chewy, gummy, fruity, tasty (not sticky, no need for sugar coating)! The recipe relies on Jello and Kool-Aid for flavor. The ones I made were strawberry Jello, lemon Kool Aid, for a kind of strawberry lemonade flavor. But, one of the great things about making something yourself, is you're in charge. Become the mad scientist that you long to be, and invent new flavor combinations, never before achieved by man!! Mwa ha ha ha! 1. In a medium glass measuring cup or bowl, stir together the gelatins, sugar, and Kool Aid. Stir in the water. Let stand for 5 minutes - time for the gelatin to hydrate. 2. Microwave the mixture for 1 1/2 minutes. Stir. 3. If using candy molds, spray the molds very lightly with oil (wipe off any excess). Fill each cavity with the gummy mixture (pour carefully or use a measuring spoon - mine took 1/2 tsp portions). If not using molds, line a baking dish with parchment paper. Spray lightly with oil. Pour the mixture into the dish. 4. 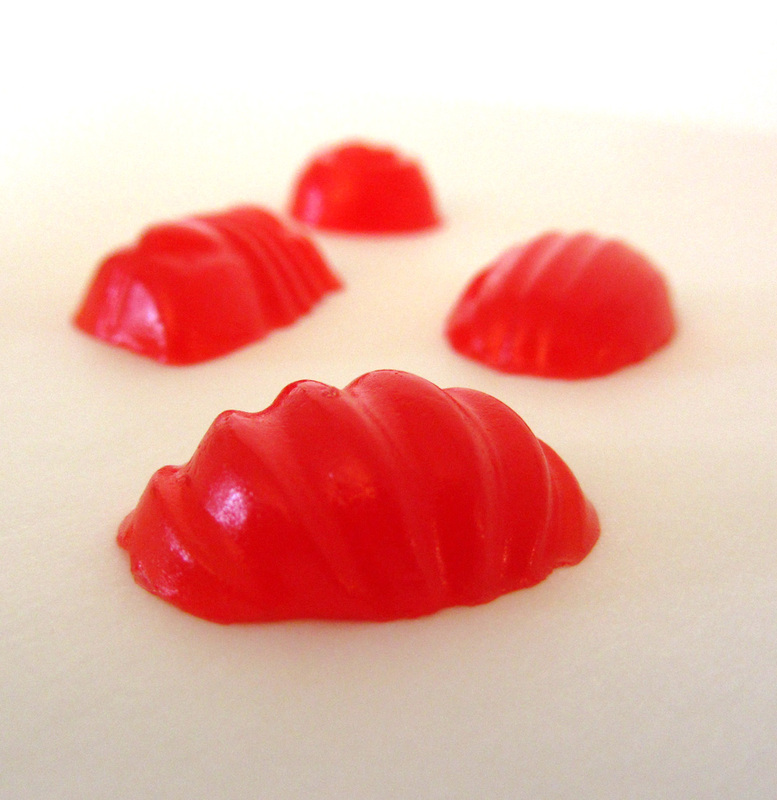 Place the molds in the freezer for 10-15 minutes, until the gummies are very firm to the touch. If using a baking dish, you can chill in the refrigerator for about an hour or until very firm. 5. Get ready a piece of parchment paper. Very lightly oil your fingers. Peel the gummies from the mold. They will seem stuck at first, but they are not fragile; they are very forgiving. Start at an edge and pull each candy out. Place the candies on the parchment paper. 6. Let the candies continue setting for about 30 minutes. If you haven't eaten them all, cover and chill until ready to serve. *For pretty swirly gummies: make two different colored flavors that work well together. Fill the cavities almost full of the lighter color. Drip the darker color in to fill completely. You will end up with more of the darker color, which you can mold by itself. Proceed with Step 4. 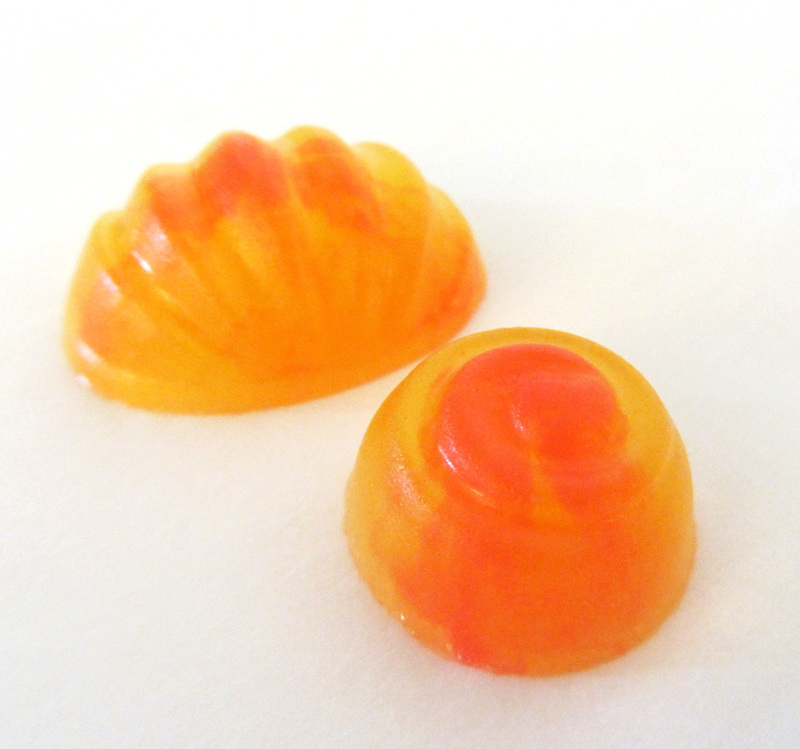 *For two tone gummies: make two different colored flavors that work well together. Fill the cavities halfway with one flavor. Chill for 5 minutes or until somewhat firm. Fill with the second color. Proceed with Step 4. I also have tried gummy candy recipe after gummy candy recipe...I can't seem to get the right texture. They seem to either be WAY too rubbery or sticky and strange. I haven't tried this recipe yet ( I plan to in a few minutes, I will totally let you know how it goes!) but I had noticed in the other recipes I used, the more gelatin there was and the less water equaled rubbery. Please say this recipe is different??? I have to get these gummy candies figured out, I MUST!! I have this problem where I am convinced most all things are better homemade, so far this isn't the case with gummies. Hoping it is now! Gummy candy ingredients also include starch and pectin....?